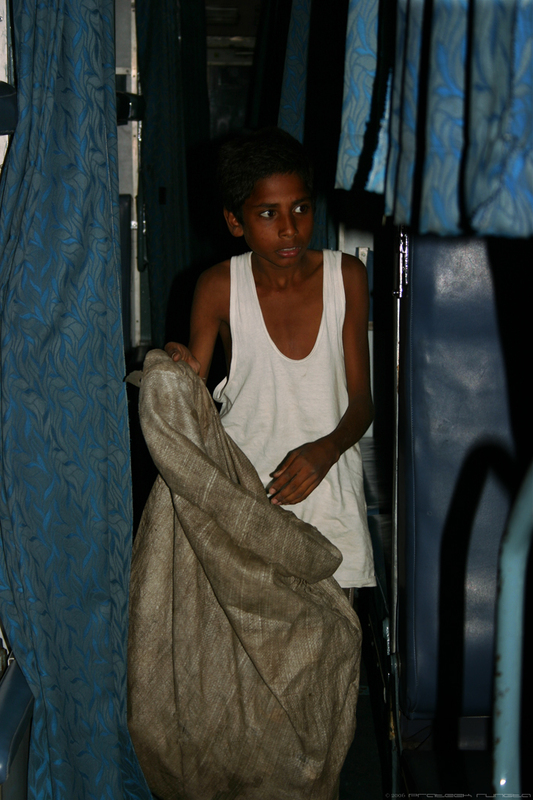 The kid's name is Ramjane and he collects empty plastic bottles from trains for a living. You can also vote for this photo. Update : I've reposted the above photo. You can view the older version here. When did u take this pic... was it when u were making that documentary stuff? Varenya's right Nag. As for wanting to have gone with us... we can always go on another such excursion when we're together next time. Hey, a photo documentary ? Sounds brilliant, hope you'll publish it here. If I am to be honest, I don't like this pic as much as your others. Perhaps, the first which I did not. I have never tried to do any 'photography', but this picture looks too 'rich' (no pun intended'. As in the colors seem vibrant, his vest is so white that it looks like he is in a surf excel commercial. Just can't feel that toned down aura of picture.The leather seats look look too glossy Just my opinion, as I said I don't have much of an idea about all this.... Is this the first of your this kind of photo on this photoblog? I think the first I have seen..
@Rashmi: I'd actually taken those pics for a documentary that Vibhas wanted to make and I never got around to completing the thing myself due to nothing but laziness, although I still want to so you may just get to see it sometime. @Aditya: You're right in that this photo is a bit too saturated. Now that you mention it, I do realize that I've increased the colour temperature so much that the photo's lost its actual tone. I'll probably post another version soon. Thanks a lot for pointing it out (and yes, this is a first of its kind on my photoblog). That's cool.. and if i remember correctly, some one was saying he didnt know how to spend his time ;) So now you have the time... you can finish or at least continue with it. I too like this new pic, much better :). Oh, you too thinking of how to spend time? Where was this taken? On ur journey back home or smth? Jus a curiosity! Good one - something diff in ur blog. @Rashmi: I know I've got time to kill but..let's just say I'd gotten so used to my Mac setup that I'm just not inspired when working on Windows (probably why the original post was so bad). @Aditya: Yes, I'm trying to find better ways of spending my time. @Bavani: I took this in May 2006 in Delhi, Nizamuddin station to be exact.